After all the things that happened in Philippines, I was happy to came across great news. Paeng Nepomuceno was honored again for the third time by Guinness Book of World Records for having won the most number of career championships worldwide. He gained 118 career titles including last September’s South Pacific Classic in Melbourne, Australia. 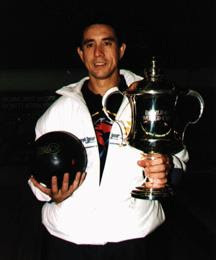 The first award Paeng got was for winning the four World Cups in the 70’s, 80’s and 90’s. The second was for being the youngest bowler to win a world title at a tender age of 19.It’s really good to know that Filipinos are making their mark in history. So, do you think Manny Pacquiao would also make it?? I hope so, but in what category?? I didn’t know he’s still playing. Kala ko retired na si Ka Paeng. Good for him kasi he still gets accolades after all these years.